Make your own gun cleaning kit for a cheap alternative to the store-bought kind. Here is a list of what you need to build your own kit. Aside from carrying your firearm responsibly, it is also vital that you learn how to clean and maintain it for your own safety as a user. Faulty guns can cause a truck-load of problems, whether you are a new or an expert gun user. Now a part of maintenance, as we all know it, is cleaning the gun after each use. Whether you pulled that trigger for self-defense or for training purposes, it is your responsibility to clean it safely and thoroughly. 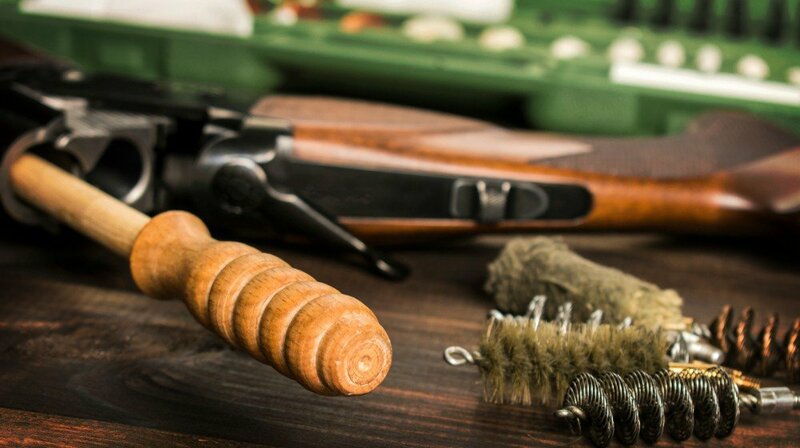 If you are worried about finding the perfect materials to clean your gun, there are so many gun cleaning kits made in the USA out on the market. In fact, most shops that sell guns also offer a variety of kits you can choose from. Nonetheless, if you find this impractical or if you want to choose the items yourself, you can create a gun kit of your own. This way, you can customize the kit to be just right for you and save some money. The best pistol cleaning kits should have a case. To start your kit, you’ll need some kind of box or bag to store everything in. A toiletry bag will do just fine. This is used in the initial phases of gun cleaning. Copper-removing bore solvents work best on firearms since they can easily get rid of powder deposits. A thin coating can help you prevent parts of your gun from rusting. On the other hand, thick coating can attract debris. Therefore, always apply a thin coat when you’re already putting lubricants on your gun. Cotton patches are the preferred choice. Round or rectangular. Your rifle cleaning kit needs to have a brush. Plastic or brass brushes are best if you own a rifle. Not too big, not too small. It should fit down your bore just right. If you are handy with a hacksaw, you can trim down the rod, but trim it from the handle side so you don’t have to re-thread anything. Brushes can help you remove unwanted dust and dirt from tight spaces within your gun. Choose cotton over synthetic, as they are better at holding solvents. This magical cloth can remove all the invisible debris that keeps your gun from looking posh, flawless, and handsome. So there you have it — the kit essentials you need to clean your gun. Now, our lawyers say we have to remind you to always unload your gun and test for safety first before cleaning it to avoid any disaster from happening. Lawyers are dumb, but so are you if you clean a loaded firearm! Have you built your own kit? Do you have any bits of advice for building theirs, or even cleaning their gun? Share with us in the comments section below. Editor’s note: This post was originally published on March 23, 2015, and has been updated for quality and relevancy.